I hope you have been able to follow my new series, "Theology Thursdays FOR KIDS!!" To read the introduction to this series click HERE! In lieu of this new series/topic I came across this GREAT six minute video and I am hoping you will take a moment to be encouraged and challenged by it! Below are a couple quotes from the video. "It would certainly NOT bring us much joy if three decades from now it could be said of our children that they know their God-centered bible studies, they have an arsenal of memorized verses, and they grew up in a home with godly examples for them, BUT they did not EMBRACE the gospel or treasure Christ as their Lord and Savior." "We cannot incline their hearts to the Lord but we can put them in the path of blessing...Surround them with means that, we pray, God will use. Means of grace God will use to bring them to faith." Watch the video below or click HERE to watch! The Ultimate Goal of Parenting from Children Desiring God on Vimeo. As we seek to teach and train our children the gospel we realize that only God can bring them to Salvation. Yet, we are reminded in Romans 10:17 that, "Faith comes from HEARING the message, and the message is HEARD through the word of Christ." Let us be diligent to TEACH the gospel to our children so they may HEAR the word of God. Let us PRAY for their salvation and wisdom to guide them into a personal understanding of Christ their Savior and Lord. 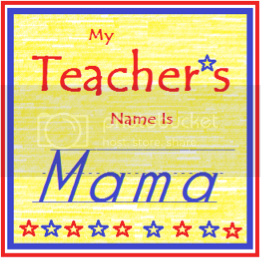 Please consider joining, "My Teacher's Name is Mama" every Thursday for a gospel driven, Christ centered, theology packed lesson FOR KIDS!! Labels: Bible, Theology Thursdays FOR KIDS!! !